Thursday April 15th 1897 I was busy all the forenoon with the dinner. Henry got through but would not stay till dinner. It began to rain. As it stopped late in the afternoon I went over to Auntys a little while. I read in the evening. Friday April 16th 1897 It had turned colder but we went to town this morning. It was the most unpleasant ride I have taken for some time, the roads are terrible. I did a lot of shopping. We got a present for Jennie Woolf wedding. Was over home for dinner and walked over to Woolfs for an hour. We got home in time to do the chores. I was very tired tonight. Wrote to Fanny. Saturday April 17th 1897 We did not need to got to town today. I dressed a turkey and churned before dinner. In the afternoon I went over to Auntys after I did up the work. The boys finished putting in oats. Sunday April 18th 1897 Easter Sunday and a very disagreeable day. It was warmed but the wind blew a perfect gale. I was all the forenoon cooking the turkey and getting dinner. I read and rested in the afternoon. Some of the children were here awhile. 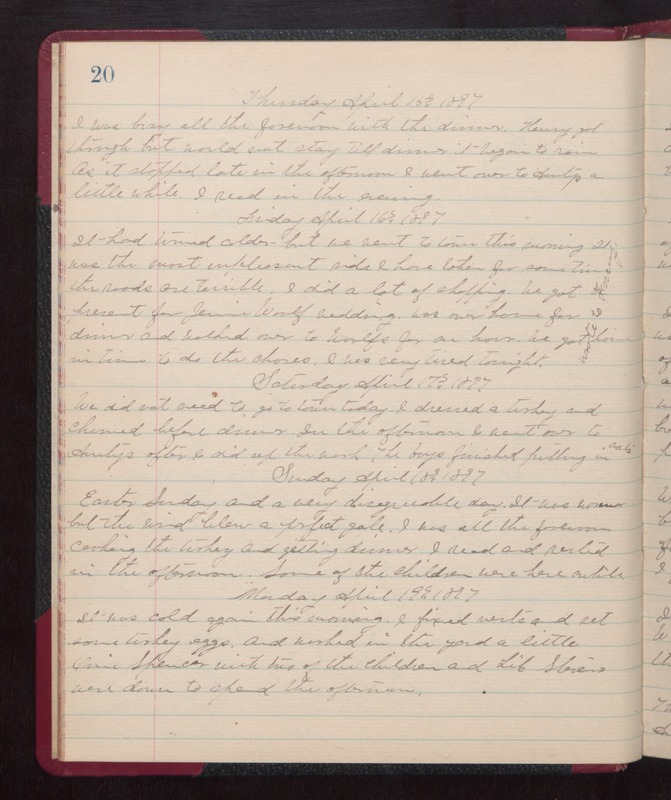 Monday April 19th 1897 It was cold again this morning. I fixed nests and set some turkey eggs. And worked in the yard a little. Orie Spencer with two of the children and Lib Stevens were down to spend the afternoon.